This silver coin is the first coin of the "Australian Saltwater Crocodiles" series, which is now published annually by the Royal Australian Mint in collaboration with the Australian Zoo. The first coin of this 12-year series is called "Bindi", named after the daughter of the late Steve Irwin, the founder of the Australian Zoo. 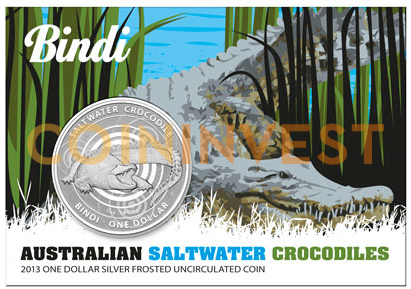 The back of the coin portrays Australia's deadly and dangerous saltwater crocodile with its mouth open. The front features the Raphael Maklouf effigy of Her Majesty Queen Elizabeth II. This uncirculated Australian silver coin is minted by the Perth Mint from 1 ounce of 999/1000 pure silver. Each coin comes in the original blister.